* Lime In The Coconut: For the love of Grapefruit! Congrats Linda on your treasure! Mmmm... your photo of grapefruits made me hungry for one. Congrats on your new gift, Linda. The grapefruit sounds yummy! Linda, I am so glad you loved your prize And what a great post describing your experience too! Made me feel like I could almost smell it all the way through the screen! I believe we will be doing another giveaway like this at Blissfully Domestic in December so hopefully your readers will try to win one of their own! How fun to win a prize from The Inspired Room, I love grapefruit, but don't eat them enough--seems like when I go on vacation that is when I eat them!!! Happy Thanksgiving. they ARE the essense of vibrant life...lucky you! Congrats on your prize Linda! The photos of the grapefruits make me want a fresh picked one now!! Fresh grapefruit...anything fresh sounds wonderful. Glad to know these do have a real/fresh scent. 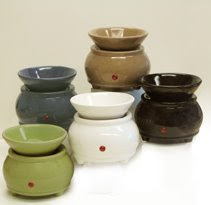 I have some with the little sticks that pull the scent and it is not as good as your wonderful gift sounds. I love grapefruit, too, but I'm partial to the Texas Ruby Reds! :-) In fact, we had some for breakfast today. Another luscious grapefruit scent is Jo Malone's cologne. MAKE SURE you visit me tomorrow! One of the pleasures of winter. Big, fat, red, juicy grapefruit! My MOTH (Man-of-the-House)would love this post Linda! He's such a grapefruit fiend, he'd eat them all day if he could. We occasionally see the Ruby grapefruit from California & Florida in our fruit markets (we can't seem to grow that variety here) & they are always wonderful. Your prize sounds fabulous - enjoy! how sweet to take such pleasure in something so simple as the scent of a grapefruit - I can nearly feel the zesty citrus! 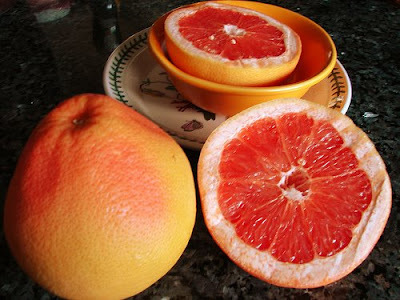 the pic of the grapefruit looks mouth watering juicy.